Potato chips recipe- sharing my easy tried and tested recipe for making homemade potato chips. crispy, light and very delicious potato chips that you can flavor as you please. It is really easy and with few tips you can make best potato chips are home. Here is how to! Unlike common thought it is really easy to make perfectly crispy potato chips at home. You just have to select the right kind of potatoes and a proper gadget to slice them. Potato chips is a favorite snack for all universally. It is available in so many flavors and I like Indian style potato chips seasoned with red chili powder the most. The other two popular variations are pepper flavored potato chips and plain salted potato chips. Potato chips recipe is fairly straight forward and easy, only thing we need to keep in mind few things like selecting the correct type of potato, oil temperature etc before making potato chips. We as a family love crunchy snacks, instead of buying absolutely unhealthy and preservative laden snacks from the shops I make easy crunchy snacks like this potato chips, sweet potato chips, plantain chips, cornflakes mixture, sago mixture, chivda and more. Which Potatoes Are Best For Chips? Select new potatoes or the light colored potato or white potato for making chips. Do not very old and matured potatoes. Russet potatoes will also be good for chips. 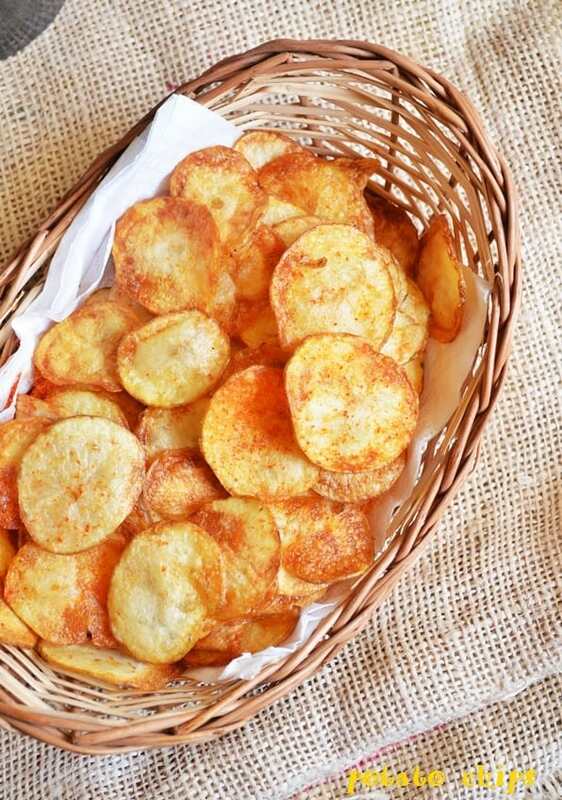 There are many variations in potato chips recipe, in few recipes potato slices are immersed in salt water,dried and then deep fried, in few other recipes potato slices are double fried, salt water,but the method I am blogging today is the easiest method to make potato chips at home, I would say. How To Bake Potato Chips In Oven? Instead of frying the chips you can even bake the potato chips in oven. Wash and scrub the potatoes very well. Slice and soak in salted water as you slice all the potatoes. Drain very well and dry on a kitchen towel for 10 minutes. Preheat oven at 220 C.
Arrange the slices on a greased baking tray in single layer. Give a quick spray of oil if needed. Bake for 10-12 minutes. Select big potatoes of uniform size. Wash and scrub thoroughly to remove all the dirt and mud. No need to peel the skin. Dry them on a kitchen towel. Using a good quality slicer slice the potatoes thinly. Soak in salted water as you slice. Drain and dry for 10 minutes. Heat oil for deep frying and slide the dried slices into the oil. Do not over crowd the pan,fry the slices in batches. Once you add the potato slices,let it fry till the sizzling noise ceases and bubbling of oil settles down. Keep turning once in a while. Once done,wait for 2-3 seconds and remove the chips to a kitchen towel. In a small bowl mix required amount of salt and chilli powder and keep aside. Once you have finished frying all the slices,toss the salt and chilli powder to the chips and mix well. Let it cool thoroughly. Store the potato chips in airtight box and serve as needed. Do not over crowd the pan,fry the slices in batches. 2. I have used refined oil here,you ca use sunflower oil or even coconut oil. Hello Harini! These look just wonderful — I’m going to make these tomorrow, I think. (If I can get to market) Your presentation is really great and I can tell you love what you are doing here. Thank you! What do you think of baking them in a flat pan ? Would that work ? Would I need foil underneath or foil ?